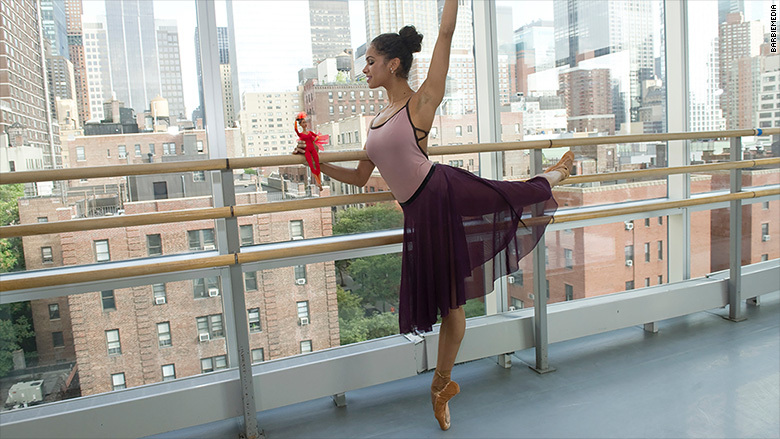 As one of the few black female dancers representing major US brands in national ad campaigns, ballerina Misty Copeland hopes more companies see the value in having women of color as their public face. "Representation is so powerful," Copeland tells CNN's Poppy Harlow in the latest episode of Boss Files. That's especially true for the young women of color, who look to Copeland and others like her for inspiration. "For them to see a black woman in a magazine or with a beauty brand, so many black girls grow up thinking that they're not beautiful, like they don't look like the women that are on the covers of magazines," she says. Copeland hopes her image sends a message to "the little black and brown girls... 'That could be me.'" Copeland was the first African-American woman to become a principal dancer for the famed American Ballet Theatre, which performs in New York's Metropolitan Opera House and tours around the world. Her personal story has been told in books and a documentary. She has been named to the Time 100: Most Influential People list. She has also graced the covers of Elle, Variety, Self, Essence and other magazines. There was even a Barbie made in her likeness. "I think it's important for people to see first of all, that I'm not an actress or a model. I'm a person, I'm an artist, I'm a black woman. I'm all of these things and that that can be beauty as well," she tells Harlow. Endorsement deals with companies like Under Armour have helped spread Copeland's fame beyond the dance world. She became an Under Armour ambassador in 2014, starred in a TV commercial and a digital ad that told the story of the rejection she faced early on in her career. Last year, she became the public face of Estée Lauder, promoting the fragrance Modern Muse. Her multi-year contract includes TV, as well as print and digital ad campaigns. And this month, she launched her first signature clothing collection with Under Armour. Among Copeland's other brand partnerships are Dannon, Naked Juice, Coach and Seiko. Misty Copeland is the first African-American woman to become a principal dancer at American Ballet Theatre. Few African-American females in the athletic world have become such big names in the media world. Tennis star Serena Williams has long been one of the faces of Nike and Chase. She has also graced the covers of magazines, including Vogue and Vanity Fair. Her sister Venus Williams has landed deals with Jamba Juice and Polo Ralph Lauren. Laila Ali has deals with Dr. Pepper, Ford Motors and Adidas, and has appeared on the cover of Cosmopolitan and Time. But they are part of a very small group of female athletes of color who have landed endorsement deals due to their successes and winning personas, says Doug Shabelman, president of Burns Entertainment, which matches celebrities with corporate sponsors. "I do not think it is a lack of sponsors looking at African-American women, as much as it is the lack of national and international winning names who have the name recognition, championship titles and [who play in] sports that garner attention as much as other sports," Shabelman says. Yet, Copeland is defying the odds -- and she is helping to pave the way for other women. Under Armour has also signed with African-American track and field athlete Natasha Hastings. Copeland says she is selective about the brands she associates herself with. "I'm not gonna commit to something that ... I don't completely stand behind. That's not authentic for me," Copeland says. Last year, for instance, she spoke out against Under Armour CEO Kevin Plank after he said that having such "a pro-business president" like Donald Trump "is a real asset for the country" during an interview with CNBC. Plank made the comments after the president had issued an executive order banning the entry of people from Muslim-majority countries into the US. "I strongly disagree with Kevin Plank's recent comments in support of Trump as recently reported," Copeland wrote in an Instagram post. "The one topic I've never backed away from speaking openly about is the importance of diversity and inclusion. It is imperative to me that my partners and sponsors share this belief." Copeland was joined by other Under Armour-sponsored athletes, Stephen Curry and Dwayne "the Rock" Johnson, in opposition to Plank's comments. Under Armour later released a statement saying it engages in "policy, not politics," and Plank took out a full-page ad in the Baltimore Sun to state that his "choice of words" in the interview "did not accurately reflect" his intent. In August, Plank quit Trump's manufacturing council. "I do think it is my responsibility, especially as a black woman to have a voice and to take a stance when there are things that I don't agree with," Copeland tells Harlow. Under Armour has called Copeland the "epitome of a powerful woman" and Estée Lauder has said she is a "wonderful role model." Copeland says she hopes she can continue to use brand partnerships as a way to inspire others along the way. "I think just accepting and loving who you are, to me that is so powerful, when you have that strength and beauty on the inside and the outside," Copeland says.